According to Reflex Handling and Storage , Dumpmaster bin tippers offer quick, efficient disposal of waste from wheelie bins to dump bins. The Dumpmaster has a maximum lift capacity of 260kg and a choice of 3 standard tipping heights (1230mm, 1530mm or 1830mm). Options of battery powered 3 phase or single-phase power packs. Cradles are also available to suit all bin types. The Dumpmaster is already being used widely throughout supermarkets, hospitals, factories, government, construction and the hospitality industry for safe bin and container emptying in a diverse range of situations, particularly where space restrictions apply. 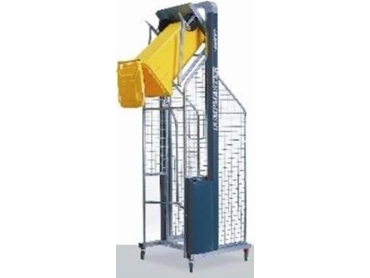 The vertical hydraulic lift (no dangerous arc) and advanced safety features that make this machine ideal are attracting more and more interest in industries where safety, efficiency and versatility are paramount. The construction industry is the recent to introduce the Dumpmaster, which is already having OH&S benefits on workers. On-site debris previously carried in wheelbarrows and then shovelled up into a skip is now being transported by wheelie bin to the Dumpmaster located beside a skip, where upon the bin is safely lifted and emptied at the press of a button. Construction site workers who no longer have to shovel debris from the wheelbarrow up into a skip are raving about this machine for saving their backs and making their entire life so much easier. Employers are benefiting with increased safety on-site, more efficient emptying of debris, and a reduction in back strain amongst workers. The Dumpmaster can be adapted to suit any situation, to lift 250kg to any height up to 6 metres, and to lift a range of standard and non-standard bins and containers.